So, now it’s the last week of Erasmus in Bulgaria. Tomorrow we will have a little fare-well party, then with some friends to the sea side for some days. I’m looking forward, it will be very nice for sure. I suppose this is the last post on my blog which I write from Bulgaria, at home the internet stopped working today (new month, I don’t think it’s worth to pay for it anymore, but a friend of me has her diploma presentation today, therefore I went to university and took the opportunity to make use of one of the open wireless networks around). Next week I will have one day in Sofia, on Wednesday I’m going (by way of Vienna to drop of some things) to the ‚State of the Map‘-conference (THE OpenStreetMap-conference) in Amsterdam. I’m sure I will be able to give you some „live“ impressions from there on my blog. Now I want to raise some more thoughts about cycling. Even the Sofians start to build bicycle lanes everywhere, but they still have a lot to learn. In my opionion it’s not (only) the amount of bicycle lanes that matters, it’s the interconnection of those. A good example is the first image: You see that bicycle road parallel to the big road? It’s a good road, I used it many times (for walking and cycling). But if you want to go there or leave it, you have to cross the bridge to the left (which is brand new), where you find more or less the same situation (at least you can go to some underpass), or you do it like the cyclist, who bravely crosses the big road. The second picture: Do they really want to make us cycle on that lane? Not that it’s curvy and narrow as hell, there are also many pedestrians. Beside the high possibility of accidents, the pedestrians will not be happy about the cyclists, although in fact, it’s the politians who make these stupid decisions (but they will be angry about the cyclists, like in Vienna). If I cycle, I want to cycle fast. What shall I say about the third one? Actually I’m surprised how they managed to paint the bicycle lane, maybe they were waiting for each parking space until it was free. In the last days I was watching some short movies about Copenhagen, it must be a wonderful city, especially for cyclists. I started to wonder … I know many cities, which are proud to have a high modal split (percentage of ways in a cities made by a special kind of transportation, like car, public transportation, walking, cycling, …) for cycling and walking. And those cities are glowing from their public spaces and cultural life. Do you know any cities which are proud to have a high percentage of car use? I don’t know any, because they usually are stuck with traffic. So municipalities, go out, build bicycle lanes and take the space from the roads, not the pedestrians. You can only win cultural life and happy inhabitants! Oh, and please do something against bicycle robbery … my second bike got stolen last week, while I was having a small dinner and a short beer in a restaurant. Curvy and narrow roads … only nice in the mountains. Bicycle lane or parking spaces? My studies in Sofia, Bulgaria, where I did my year of studying abroad with the Erasmus program, are finally over. Most of the things I did this semester were not so interesting, at least not for presenting them on my Blog. But one of my subjects, where I didn’t participate in the classes, but had weekly private seminar meetings, was really interesting. The subject of the class was „Environmental Policy and Sustainability“, and I was asked to write some essay about this topic. My first idea was to take some example about ecology in Austria and write about this, but then I decided, that this is lame and boring. Prof. Elena Dimitrova, the teacher of the class, gave me some books as readings about Sustainability, the most interesting being „Earth at a Crossroads: Paths to a Sustainable Future“ (read it online on Google Books) by Harmut Bossel (published in 1998). The theory behind the book: If you want to have a sustainable development, it’s not enough to just live ecological, you also need sustainability in the social system, in transportation, in your political system and in the economy. When I read the book I had to think about Linux, Wikipedia, OpenStreetMap, CouchSurfing and other initiatives all the time. So I decided to write about sustainability in digital culture and gave it a spin to politics and urban planning to get back to the topic of my studies. It took me a long time to research for this essay and to write it (even if my English is pretty good now, it’s still not my native tongue), there’s already a lot of information on the internet, but urbanism is still an unexplored field. In the process I learned a lot, and I found many ideas which I would be interested to implement. If you are interested in this topic you should definitely check out the literature references in the end of the essay. I hope you will like it, I think it got pretty good in the end. As you might see, the essay is available under a Creative Commons license, so please take it and do something interesting with it. This is the presentation to the subject, that I gave in a class (in front of a handful of people). There are two black pages, which should hold videos. The first is a great music video of a guy called Kutiman who remixed Youtube-videos. The second is a beautiful animation of the edits in the OpenStreetMap in the year 2008. Trigrad .. it’s like in the merry tales, isn’t it? I hope now I will find some time to concentrate on my project, the OpenStreetBrowser, the „State of the Map“-Conference in Amsterdam is coming close (9.-12. July in Amsterdam). Yes, I haven’t announced it yet on my Blog, I’m going there, I hope it will be very interesting! During the last weeks I even had time do some OpenStreetMap-mapping in Bulgaria. You know, I’m a passionate cyclist. But since my bike got stolen in middle of October, I’m without a ride here in Sofia. I didn’t really miss it, because this place is just not made for cycling. But, something amazing happened :) A friend of my mother, Nordfried, was doing a cycle tour from Novi Sad in Serbia to Vidin in the very north-west of Bulgaria along the Danube. To go back to their home country (Germany) they came to Sofia and wrote me an e-mail beforehand if I would be willing to help them with train tickets and show them around a little bit. For sure, I like being a guide, I myself always learn something new. After helping with train tickets Nordfried offered me to take his bike – he had just bought it in Novi Sad and has no use for it in Germany. I’m feeling so flattered … I’m very happy about it. But still I’m afraid to use it, because I don’t want it to be stolen again. And I need a good place for the night. First I need a good lock! Two days later on Saturday, there was an invitation to a „bike parade“ through Sofia, to demand more bicycle lanes. As I have my new ride now, it was mandatory for me to go there. And I was really amazed, I think there were more than 2000 people. I didn’t even think there were so many bikes in Sofia (ok, I’m kidding). Afterwards there was a small party in the „Kolodrum“, a former bicycle arena, but I decided to go to the night of museums with free entrance. I think Sofia needs some more years, but finally it could become a good place! In the last days I read in my newspaper, that – maybe due to the financial crisis – many more people uses bikes for their everyday ways in Vienna as in the last years. At the most important counting point – at the Ring near the State Opera – there’s an increase of about 25% to the last year. On other points, Lassallestraße, Kennedybrücke and Langobardenstraße the increase is about 50% (more statistics). This is really great news, I hope that the politicians now feel the need to do something (for example find a good solution for the cycle route at the Ring). 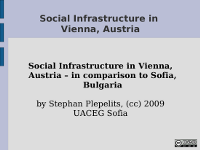 Today I gave a talk about social infrastructure in Vienna … in comparison to social infrastructure in Sofia. It was quite difficult to work on this topic, I think you could write Phd-theses about it. I think I managed quite well. If you look at it please bear in mind that I tried to hold it for someone who has the perspective of living in Sofia most of his/her life. Here are the slides. Last weekend Daniela, a friend of me (architect, half-Bulgarian/half-German, I lived at her place in Sofia in autumn), organised an event called „The Golden Nuggets“ here in Sofia. It was an experiment to explore how people react to unknown objects in public space. The objects – golden bottles with flowers; golden bags filled with balloons or goodies; black balloons with golden masks – were arranged at places where many people pass. Then we – the organisers and observers – hid and watched what happens. The results? Hard to tell and not statistically significant. In my opinion: Many people just didn’t care (maybe they are to much occupied with themselves? ), the bags with the balloons were totally ignored (but they were not that visible maybe), people were afraid of taking them, and parents usually didn’t allow children to see what’s there. The best events were the first, on a central place on a traffic island … many people stopped and looked, and in a park on a sunny Sunday afternoon, where the balloons with the masks attracted many people, especially children. It will be interesting to see a comparison between different cities and cultures. Daniela is planning to do it also in other countries, like Spain and Germany. A first test-run in Hamburg already took place. It was fun to take part in this event! Thanks a lot for the nice idea and the commitment. Last weekend I finally managed to go to Kosovo, although it was rather spontaneous, because my partner for the planned hiking tour got ill. Unfortunately CouchSurfing in Kosovo didn’t work out, so I had to stay at a guest house in Prishtina and didn’t really get in contact with people there. You are wondering, whether Kosovo is a safe place to go? According to the channels that I checked (Wikitravel, Homepage of Austrian foreign ministry, …) the main danger in Kosovo right now are unexploded land mines, and you won’t encounter them as long as you stay „on the beaten path“. I never felt afraid when I was visiting places, in fact people were always friendly and helpful … which seems to be natural in islamic cultures. The main population in Kosovo are Albanian origin, which was also the reason for the wish of their independence. The Albanian flag is also the second most seen flag around. If you have already seen some places in Eastern Europe, it doesn’t look so much different. A lot of block buildings from communist times, in between smaller, older buildings. You see a lot of foreign organisations, especially the military organisations United Nations and KFOR (NATO), but also European Union and OSCE. Striking to me was the presence of so many unfinished buildings, especially on the country side, where I passed them in the buses. I was surprised about the dense network of buses, there are buses to the other major cities every 15 to 30 minutes. For sure it’s not a big country, but still it takes up to three hours. Prishtina is the capital of Kosovo and has the same problem that many capitals face: They grew too fast. On the second day I went to see Prizren, a smaller city in the south-west of the country. First I was a little bit disappointed, but after some searching I found the city centre, with a small river flowing through it. Next to this you have a hill with a huge fortress (which is now used by KFOR) and some damaged houses from war. When I came there I saw, that some race will take place later on, but first the KFOR had to remove their tents from the main square. Later a womens car race where held, who had to find their way through a parcours. The river in the centre, with a view on snow covered mountains. Another view to the centre, with the mosque dominating the scene. Peja is an even smaller town to the west of Kosovo. It has two centres: A turkish bazaar and a pedestrian zone with cafes and restaurants. I was surprised to see some many people on the street enjoying the day … although it was Monday. I also enjoyed some grilled meat with some salad. And I enjoyed the view on the snow covered mountains. When I left Peja I had a talk with the guy from the toilet. He lived in Germany for 23 years and got deported 4 years ago. He wants badly to go back, because he’s missing his wife and his two children, but unfortunately he was not married. So, my conclusion about Kosovo: People can live a normal life. For sure there are still many problems, but there’s a lot of development going on. Mainly with foreign money, we will see how they will develop, when they have to live from their own income (talking about money: the official currency is the Euro). Finally I arrived in my (nearly) last stop of my travel – Timişoara. It’s the second largest city of Romania and – at least Geographically seen – the most western city of Romania. It has a large city centre with several pedestrian zones and squares, orbited by parks and on some parts by the river Bega. Around the city centre you have the typical suburban settlements of Communist era. Again I spoke most of the time German, my CouchSurfer there is working as translator for German to Romanian language. And we even visited a performance in the German National Theater Timişoara (Deutsches Staatstheater Temeswar): „Alles zu seiner Zeit“ by David Ives. The most interesting and touching thing I’ve seen in Timişoara was the Archive about the Revolution in 1989. Timişoara was the first city to protest against their leader Ceausescu and it was also the first city were the first people died. The director – who was veterinary before the revolution and got badly wounded – loves to talk and show you around. During a movie about the revolution and in the gallery showing the works of children after the revolution, I nearly started crying. Don’t miss it, if you ever come to Timişoara. I couldn’t find a homepage, but if you want to learn more about the revolution, I can recommend you this page. After Timişoara I had to find a way back to Sofia. It was not so easy, there’s only one bridge between Romania and Bulgaria, in the East of the country, options would have been to go over Belgrade (with a break of 12 hours) or with a ferry between Calafat and Vidin. I finally decided to go over Bucharest, which took me 18 hours and additionally 5 hours in Bucharest which I used to visit the Museum of Peasants, which was really nice (although more English or German descriptions would be nice). The even have some old wooden houses and an old wooden church on display. Being back in Sofia, I got a message from my friend who should visit me on Monday (which was my reason to come back to Sofia), that he has to cancel his visit. So I have to go traveling again! Next stops will be Kosovo and Albania. First I thought about leaving Monday morning, but my new flat-mates told me they can’t afford the rent and will move out at the end of February. As my other flat-mate is not in Sofia for most of the month, I have to search for flat-mates now. But the new Erasmus students are arriving, so it will be easy to find people. My last stop in Romania shall be Timişoara, but before I was recommended to go to Roşia Montană. My CouchSurfer gave me a ride to Alba Iulia (she had to go there from her work), which is a not very nice city. It looks as urban development just happens there, without noticeably structure. The interesting thing: There’s a huge fortress from the 18th century, shaped like a star. Most of it is unused, and when I was walking through this place I started dreaming about a festival. It would be a great place with all these backyards and big places. Imagine stages, rows of tents and stands selling various goods. Roşia Montană is a mountain village with gold and copper mines, which were exploited in antique times for the first time. During industrial revolution it became a wealthy place, many workers came there and populated the area. Unfortunately it all went down in the 1970s under communist regime. At the moment it’s a sad place with deserted houses, unemployed workers and aggressive stray dogs. But underneath you can still feel the beauty of this place, every church has it’s own place of worship, the workers‘ buildings are ornamented and it’s situated in a mountainous area with interesting rock formations. In the last years Roşia Montană got some publicity, as there is one Canadian company, which is trying to built a new mining project (since 11 years). Especially the young ones fear, that the project would ruin the place. On the other hand the company (using fancy buzzwords like ‚Sustainable‘, ‚Ecologic‘, ‚Community Process‘, …) promises to clean the place (some of the streams are already heavily polluted), bring new jobs and develop tourism. Tourism is also the option for the people opposing the project, but I don’t know where the money should come from – you need some huge investments to renovate the place and make it better accessible. I was talking to „Pro Roşia Montană„, a non-governmental organization, supporting this project. They say, they would support any project, because as it is now, the people can’t survive there. But they are also thankful for the opposition, at least the company had to bring strong arguments and to think about alternatives. In Roşia Montană there’s even a small hostel, managed by a young couple. They are nice, and it’s a good place, so if you ever happen to come to Roşia Montană, I can recommend to stay at there place (It’s situated 800m back the main road from the main square and called „La Gruber„). I was the only guest (in fact, they were really surprised, that somebody is coming), but they said, that in summer it’s usually full. They also oppose the project, in fear, that the company will ruin this place. I’m sure the hostel would make it, it’s a small place, and there will always be some people going to strange places.